Locally advanced cervical cancers comprise a large majority of the gynecologic cancers in India and other developing countries. Concurrent chemo-radiation has improved the survival of high risk stage I and stage II cervical cancers. There is no evidence that the same survival benefit has been achieved with chemo-radiation in stage III and stage IV disease. Interferon-a and Retinoic acid have synergistic anti-proliferative activity. In combination with radiation, they substantially enhance the sensitivity of the squamous carcinoma cells to radiation. Based on these observations from the in vitro studies, a few clinical trials have evaluated the combination of interferon-a and Retinoic acid, concomitant with radiation, to treat cervical cancers. The results from these early trials were encouraging and the combination had minimal toxicities. However, till date, no phase III randomized controlled trial has been done to evaluate this therapeutic modality. BACKGROUND: Predictors of survival and response to treatment in patients with small cell lung cancer (SCLC) are ill-defined and unclear. In an attempt to assess the impact of common presenting symptoms and laboratory values on survival, we undertook this retrospective review of patients with SCLC. 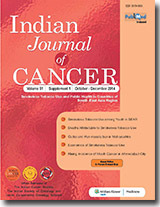 To our knowledge, there is no study on survival in SCLC patients from the Indian subcontinent. DESIGN: Retrospective Cohort study. MATERIALS AND METHODS: All newly diagnosed small cell lung cancer cases from December 2001 through December 2004, were identified and clinical data on presenting symptoms and laboratory findings from their hospital records, noted. The influence of various pretreatment factors on survival was investigated using Kaplan-Meier plots and Cox multivariate regression model. RESULTS: 76 subjects were included (84% males, 91% smokers). 57% patients had five or more symptoms at presentation. Cumulative symptom burden was strongly associated with survival ( P =0.02). 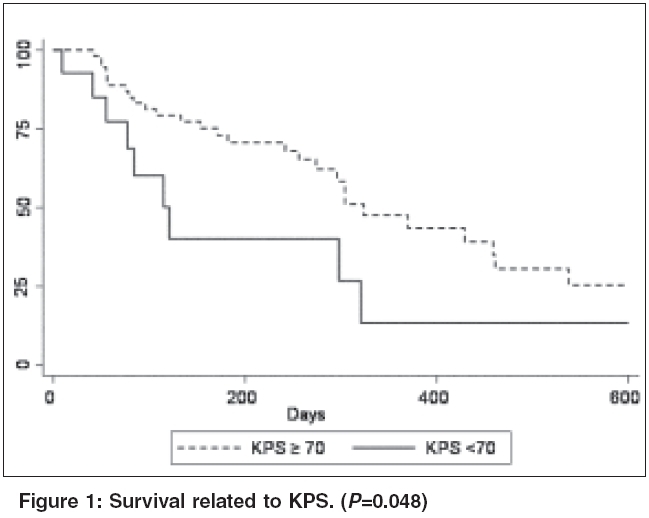 Survival was also significantly related with Karnofsky performance status (KPS) ( P =0.04), disease extent (P =0.03) and symptomatic response to treatment ( P< 0.001). Patients with higher hemoglobin ( P =0.02), serum sodium ( P =0.04) and serum globulin ( P =0.02), survived significantly longer. By multivariate regression analysis, hemoglobin, KPS and brain metastases, were significant predictors of survival ( P =0.01, P =0.02, P< 0.01 respectively). CONCLUSION: Cumulative symptom burden, KPS, disease extent and symptomatic assessment of improvement after treatment, are useful predictors of survival. This has important clinical implications, keeping in view, the infrastructure and cost involved in more objective tests like CT scan, for evaluation of disease extent and prognosis. These findings can provide a simple basis for predicting prognosis in small cell lung cancer, especially in developing countries like ours. 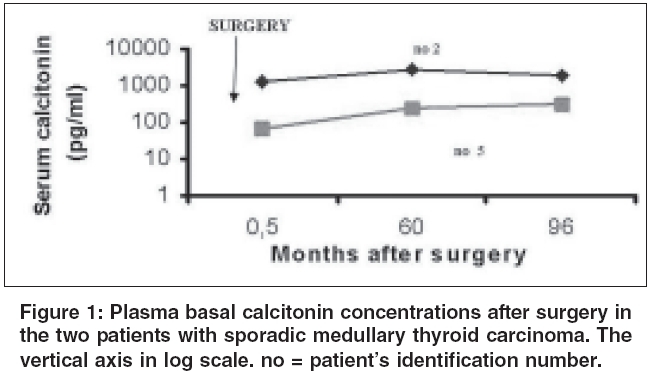 BACKGROUND: Calcitonin is the most sensitive and specific marker for medullary thyroid carcinoma (MTC). AIMS: The aim of this study was to emphasize the role and the limits of plasma basal calcitonin (bCT) measurement in the management of Moroccan MTC patients and their relatives. Settings and design: This is a retrospective study on 6 MTC patients referred to our institute from January 1996 to December 2004. MATERIALS AND METHODS: Serum bCT levels were measured in 36 individuals comprising six known MTC cases, 18 relatives and 12 healthy volunteers, using two-sites immunoradiometric assay method. Five of MTC patients have been followed from 12 to 96 months after surgery. STATISTICAL ANALYSIS USED: Calculations were performed using SPSS 10.0 program. Data comparison was done by Student's t -test. RESULTS: The circulating preoperative bCT concentrations were elevated for all MTC patients (range, 44,8 -2055 pg/ml, normal < 10). Recent postoperative bCT determinations varied from 24.4 to 1972 pg/ml in four patients. In one patient, the bCT value decreased to an undetectable level during a follow-up of 12 months. The mean bCT level of relatives was 4.90 ± 3.54 pg/ml; two patients had slightly elevated bCT. Five (42%) healthy volunteers had undetectable bCT levels and all had less than 10 pg/ml; the mean bCT value was 3.06 ± 2.51 pg/ml. CONCLUSIONS: Routine plasma bCT measurement still has an important place in the preoperative diagnosis and follow-up treatment of MTC. BACKGROUND: Systemic therapy with radionuclides may be used for the treatment of patients with painful skeletal metastases owing to its efficacy, low cost and low toxicity. Imported radionuclides for pain palliation, like Strontium-89 are expensive; particularly for developing countries. In the Indian scenario, Samarium-153 (Sm-153) is produced in our own reactors and as a result, it is readily available and economical. AIM: We undertook this study to determine the efficacy and toxicity of single-dose Sm-153 ethylenediamine tetramethylene phosphonate as a palliative treatment for painful skeletal metastases. 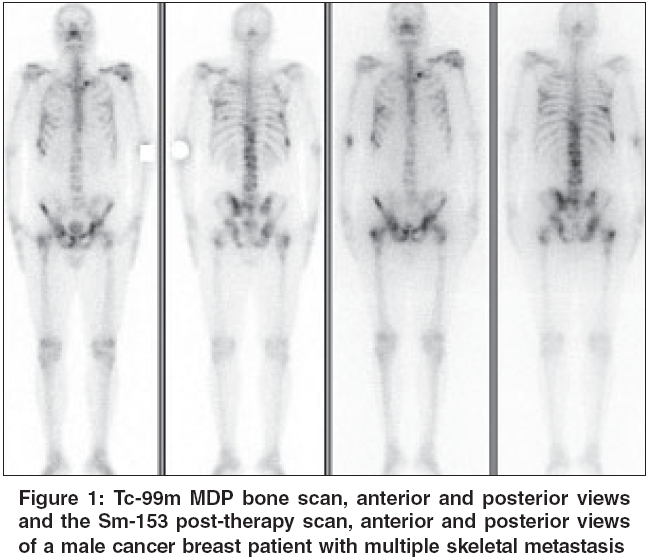 MATERIALS AND METHODS: Eightysix patients with painful skeletal metastases from various primaries, were treated with Sm-153 EDTMP at a dose of 37 MBq/kg. The effects were evaluated according to change in visual analogue pain score, analgesic consumption, Karnofsky performance score, mobility score and blood count tests, conducted regularly for 16 weeks. 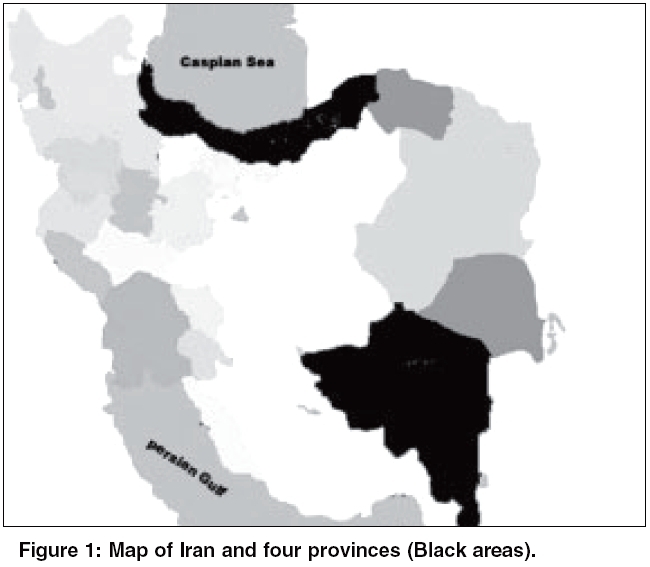 STATISTICS: Repeated measures analysis. RESULTS: The overall response rates were 73%, while complete response was seen in 12.4%. Reduction in analgesic consumption with improvement in Karnofsky performance score and mobility score, was seen in all responders. Response rates were 80.3 and 80.5% in breast and prostate cancer, respectively. One case, each of Wilms tumor, ovarian cancer, germ cell tumor testis, multiple myeloma, primitive neuroectodermal tumor and oesophageal cancer, did not respond to therapy. No serious side-effects were noted, except for fall in white blood cell, platelet and haemoglobin counts, which gradually returned to normal levels by six-eight weeks. CONCLUSION: Sm-153 EDTMP provided effective palliation in 73% patients with painful bone metastases: the major toxicity was temporary myelosuppression. 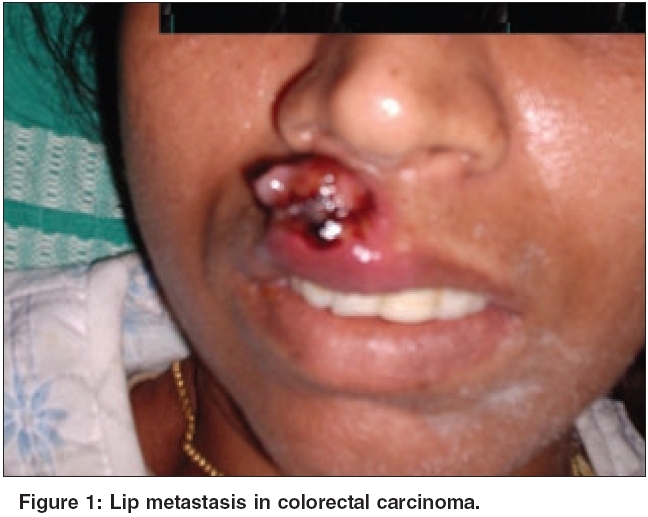 Metastasis from colorectal carcinoma occurs by either lymphatic or hematogenous spread. The most common sites of colorectal metastasis are the liver and lung. Involvement of the skin, muscles and bones are quite rare. The prognosis in such patients is usually poor. Herewith, we are reporting a case of colonic carcinoma who had cutaneous metastasis, muscular involvement and diffuse skeletal metastasis. At the end, she had brain metastasis, but liver and lung involvement was not observed till the end.